Third-party logistics provider Kane Is Able, Inc. is honored to have received the 2017 “Customer Service” award from the American Logistics Aid Network. (ALAN). Kane Is Able President & CEO, Michael Gardner, receives the 2017 ALAN award in Customer Service. Third-party logistics provider Kane Is Able, Inc. (KANE - http://www.kaneisable.com) is honored to have received the 2017 “Customer Service” award from the American Logistics Aid Network. (ALAN). 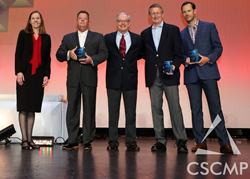 The award was presented at the annual Council of Supply Chain Management Professionals (CSCMP) conference in Atlanta, GA. When disaster strikes, it takes a collaborative effort from multiple organizations to quickly provide emergency services and assistance. The American Logistics Aid Network (ALAN) was created to help facility this process and deliver humanitarian relief needed whenever these events occur. The American Logistics Aid Network is comprised of experts in transportation, warehousing, cold storage, and distribution, who use their logistics expertise to locate and transport goods to multiple locations. ALAN’s ability to quickly provide solutions increases relief capacity which means much needed items get to those who need them. Photo caption: Pictured is Kane Is Able President & CEO, Michael Gardner, accepting the 2017 ALAN Award for “Customer Service”.